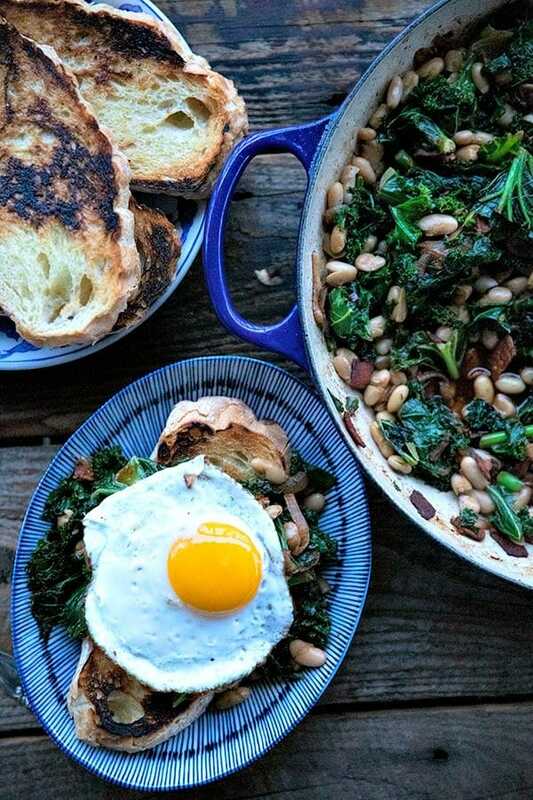 Beans and Greens are a classic American comfort food rooted in and made beautiful by a philosophy of making the most of what little you have. This is uncomplicated food -all of it individually inexpensive and delicious- at its best. I knew it was time to revisit beans and greens. 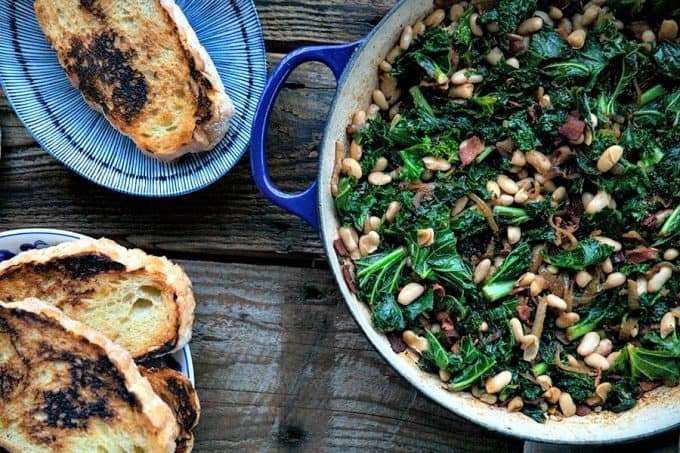 In my version, tender beans and greens pair with caramelized onions, savoury bacon, sliced garlic, smoked paprika, and a hint of spice, are stewed up in pan juices in one single pot are then served over indulgently thick slices of crunchy-edged, pan toasted bread. This is the ultimate cold weather meal and it can be whipped up in just a few minutes of hands on time, and not so much actual time, either. Busy nights can still have home cooked goodness with this greens and beans recipe. What greens should I use for my greens and beans recipe? There are a few good answers for this. My personal preference is for collard greens, because that’s what I grew up eating. It’s a familiar taste and it warms me up just to think about it. Collards have a gentle sweetness that is delicious in greens and beans. Kale is also good, but you’ll want to be sure the stems cook through thoroughly, or they can be a bit woody and tough. A good solution to this is to remove the stems, chop them finely, and sautee them with the onions. You can then add the greens to the recipe when specified in the directions. Escarole and Swiss Chard are both good, traditional greens to use, and are quite delicious. Spinach can be good, but while I adore spinach, I find that it is a little bitter tasting in the quantities needed for greens and beans. Many people prefer them, though. This one comes down to personal preference. So to put them in order of which I like best to which I like least, I’d say collard greens, escarole/chard, kale, and then spinach. That said, I’d happily eat any of them. Which beans should I use for beans and greens? This one is a little less vague. White beans are the traditional choice, with Cannellini or Great Northern Beans being the best choices. They carry the flavours well without competing, are easy to come by just about anywhere, and are inexpensive. Two cans of Cannellini beans run me about $1.80, and that’s for two cans of super high quality organic Cannellini beans at regular price at Wegman’s! You can certainly use less expensive white beans with equally excellent results. How do I serve beans and greens? You can serve beans and greens in a bowl with a spoon, but I like to church it up a bit by serving it over unapologetically thick slices of bread that I brush generously with olive oil and toast in my pan before I make the greens and beans in it. I love the way the toast chars just a bit around the edges, then soaks up all those amazing pan juices from the beans and greens. It’s like a sponge of flavour happiness. Now, it’s good enough by itself, it’s great over toast (or rice or potatoes or noodles), but it is UNBELIEVABLE if you happen to plunk a beautiful, runny yolked, fried egg or even a poached egg on top. When you burst the yolk and it runs down into the greens, it makes your beans and greens sauce even, well, saucier and more lush. Can I make beans and greens ahead of time? Here’s the thing, beans and greens are amazing when made fresh, but they’re absolutely delicious leftover and reheated. If you happened to fill a thermos full of these greens and beans, then pack a piece of toast and maybe a little hunk of cheese along with a crispy, fresh autumn apple, you might just think you’d died and gone to heaven. It wouldn’t be true, of course, you’d still be at work, school, or wherever you are that requires you to leave the comfort of your home with rations. But at least you’d have that little thermos full of “feels-like-sitting-at-my-own-table-with-my-cozy-socks-on” with you. Pssst. Pack a little bottle of hot sauce and you’ll be glad you did. 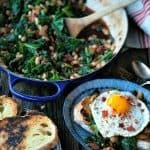 What seasonings do I use for Beans and Greens? I like to keep it pretty simple with classic thyme, red pepper flakes, salt, and pepper, but I also add a little interest with some smoked paprika. 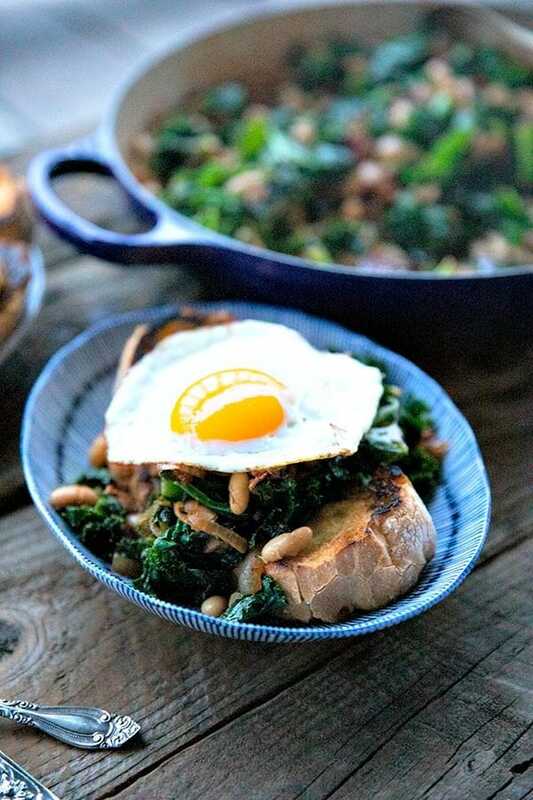 The smoked paprika is the only bit of this recipe that is a little more exotic, but that small amount of a little something different truly gives our beans and greens a little something something extra that makes it memorably savoury and delicious. 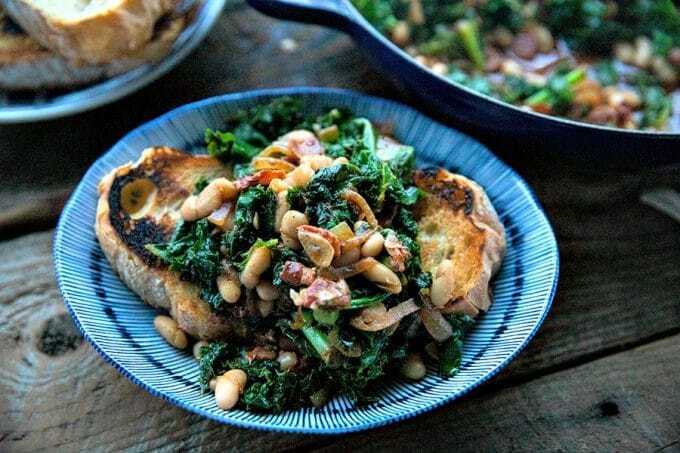 I use more onion and garlic in my version of beans and greens than a lot of recipes do, because I think this simple dish screams for the character and body that loads of caramelized onion and pan roasted garlic give. What pan should I use for greens and beans? I’m happy to say you have options. The very best option is a large Dutch oven or braising pan. 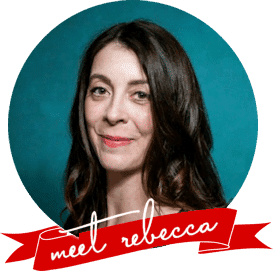 The next best options are a large -say, 12 inches or larger- cast-iron or stainless steel skillet with higher sides. You really want to be sure to leave enough room in the pan to toss your greens around in the pan sauces as they wilt. Otherwise, you’ll be saying bad words in your head or out loud as your lovely emerald greens try to make a break for it by leaping from your low edged pans. If you prepare everything in order, you should be able to prepare the toast and the greens and beans in one pan. If you opt to add a fried egg to the top, you can either fry it in the pan before doing anything else and hold it in a warm oven on a plate, or break out a smaller frying pan to do your eggs. I prefer to use a big enameled braising pan for the recipe, but a large cast-iron skillet or stainless steel skillet will also work. When I say large, I mean 12-inches or larger. No need to pulverize your garlic here. I like greens and beans best when the garlic is thinly sliced rather than pressed or minced. It will be nice and tender when it’s done cooking. While pre-washed and chopped greens are okay to use, I prefer the control that comes with buying them ‘whole’. Give the greens a good wash, but you don’t have to bother drying them. In fact, please don’t dry the greens. That extra liquid helps wilt them. If you have greens with woody or tough stems, you can pull them out or use a paring knife to cut them away from the leaves. Chop the stems finely and add them in to the pan when you add the onions. Carry on with the rest of the recipe as directed. You won’t be adding all of the greens to the pan at once, that’d be a literal hot mess. Add only as much as you can to the pan while still maintaining enough room to toss the contents with tongs or a couple of wooden spoons. It took about 4 additions in my pan. If you DO start with pre-washed/cut greens, you’ll want to compensate for the lack of extra water by adding a good splash (about 3 tablespoons-worth) of chicken stock with each installment of greens you add to the pan. The steam helps wilt and tenderize the greens. When they’re all wilted, add the stock and bring to a simmer. I’ve given options for the vinegar used in the recipe. My preference is for cider vinegar, but red or white wine, or sherry vinegar are also good! Don’t add the beans to the mixture until the stems of your greens are tender and the greens have reached the degree of doneness you prefer. When you do add the beans, you only need to continue cooking long enough to heat the beans through. If you’re looking for some excellent bread to toast up for your beans and greens, look no further than our Sesame Semolina Bread, one hour sandwich bread, Ham and Cheddar Cornbread (yes! Fry it in butter for the ultimate! ), Jalapeno Cheddar Bread, Pretzel Bread, or peruse our other bread recipes. Tender beans and greens pair with caramelized onions, savoury bacon, sliced garlic, smoked paprika, and a hint of spice, are stewed up in pan juices in one single pot are then served over indulgently thick slices of crunchy-edged, pan toasted garlic bread. Inspired by my Grandma Shaffer's recipe and Epicurious. 12 ounces collard greens or escarole, swiss chard, kale, or spinach, stems removed and finely chopped. Leaves torn into 3 to 4 inch sized pieces washed, and drained but not dried. 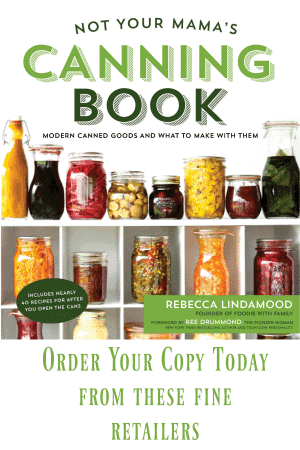 2 cans (15 ounces each) Cannellini or Great Northern Beans , drained and rinsed, or just about 4 cups of home-cooked beans, drained. Place your Dutch oven, braiser, or skillet over medium high heat. Brush both sides of your bread slices with the garlic oil. Toast in the hot pan for about 1 1/2 minutes on each side, or until golden brown with some charred bits. Remove to a plate. Return the pan to medium high heat and add in the cut up bacon strips. Fry, stirring frequently, until the bacon is beginning to crisp and has rendered at least 1 1/2 tablespoons of fat, about 4 minutes. Stir in the onions (and chopped greens stems, if using). Fry for about 4 more minutes, or until the onions are translucent, tender, and starting to turn golden. Add in the sliced garlic, smoked paprika, crushed red pepper flakes, kosher salt, black pepper, and dried thyme. Stir for 1 minute, or until fragrant. Add about 1/3 of the greens and use tongs or two wooden spoons to toss with the hot onion and bacon mixture until the greens wilt, turn bright, and shrink a bit. (If you're starting with dry greens, see Cook's Notes). Repeat this until all of the greens are incorporated into the pan. Add the chicken stock and vinegar, stir, and bring to a simmer. Simmer until the greens and stems reach your desired level of tenderness; for us, that's about 5 minutes. Finally, add the drained and rinsed beans to the mixture and toss. Continue cooking just until the beans are heated through. 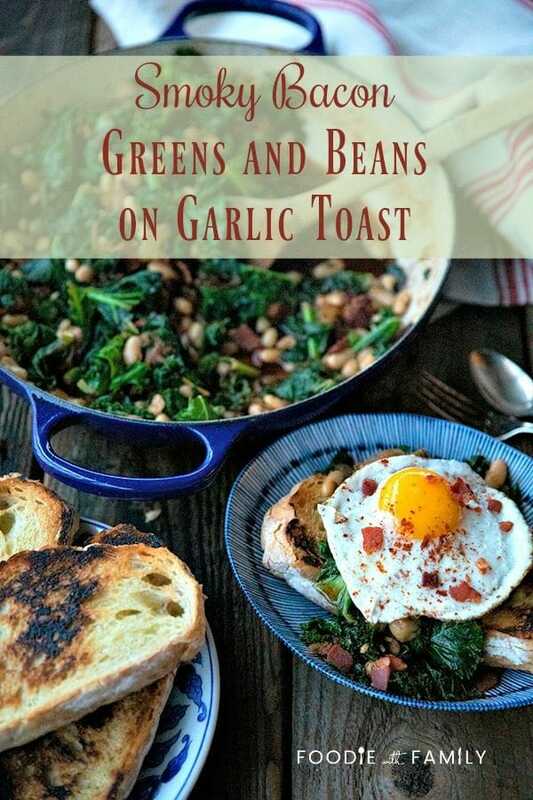 Place one piece of garlic toast in a bowl, top with a generous scoop of beans, greens, and broth. If desired, top each serving with a fried egg and a dusting of smoked paprika. Awesome dinner!! Halved the recipe and omitted the bacon, gasp. Boyfriend will not eat bacon. Didn’t even miss it and I love bacon. Used some delicious sourdough bread and this was just the best dinner without the eggs either. Thank you so much! I’m so glad you loved it, Marry! How fantastic is this! 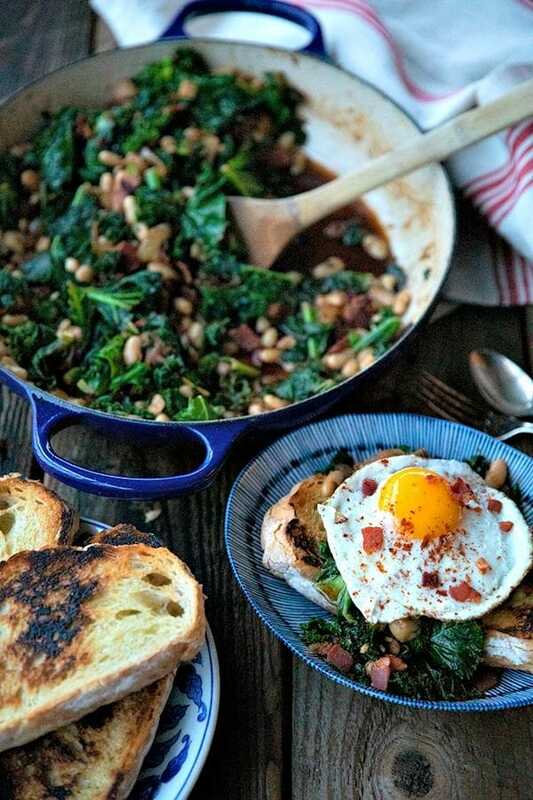 I love the idea of a white beans and greens. Thanks!